At their best, Egon Müller's wines embody the crystalline purity and total sense of timelessness that perhaps only Riesling is capable of among white varieties. Over the years I have been fortunate to taste the estate's wines back to the 1950s. These two more recent examples are haunting for their beauty and are destined to take their place among the great vintages here. What a treat it is to taste and drink these two extraordinary Rieslings from Egon Müller. 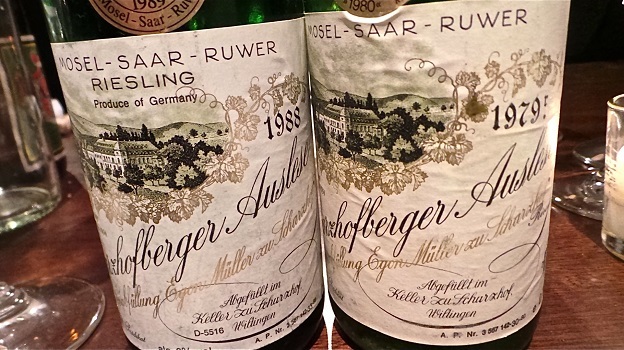 The 1979 Scharzhofberger Riesling Auslese (Auction) reveals an amber color along with beguiling aromatics and fabulous overall texture. Rose petal, mint, wild flowers, hazelnuts and tangerine peel meld together in an utterly effortless, gracious Riesling of the highest level. The 1979 fades in the glass a little bit over the time I follow it, but it remains hauntingly beautiful and expressive. Well-stored bottles will drink well for another decade or so. 95/Drinking window: 2015-2025. Even better, the 1988 Scharzhofberger Riesling Auslese (Auction) soars from the glass with an exotic, beguiling tapestry of aromas. Here the flavors are bright, precise and nuanced throughout Quince, pear, white flowers, marzipan and lemon oil abound in a wine that remains miraculously fresh and invigorating. While the 1979 fades over time, the 1988 only continues to grow until, sadly, my glass is finished. Readers fortunate enough to own the 1988 can look forward to another 20 years of breathtaking drinking. 97/Drinking window: 2015-2035.